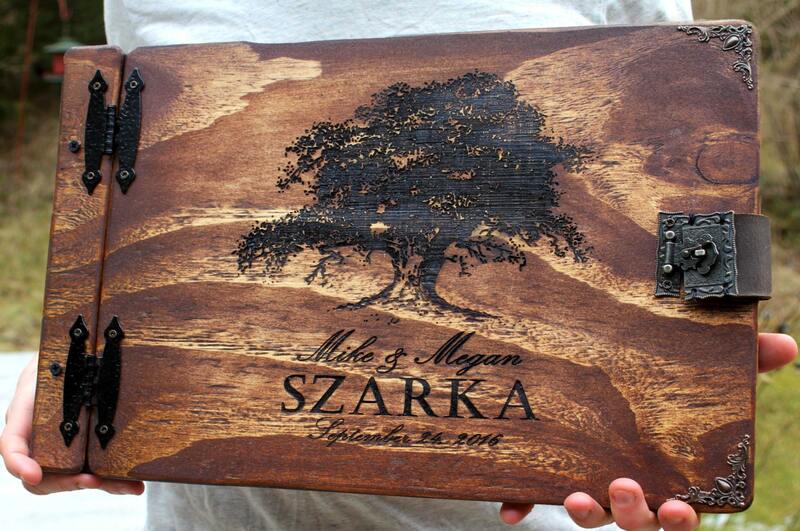 This handmade wooden wedding guest book / album with tree and personalized engraving is made to order from hand cut, sanded, and stained wooden sheets. The stain is applied to the wood in a laying technique to give the wood a rustic, yet chic appearance. 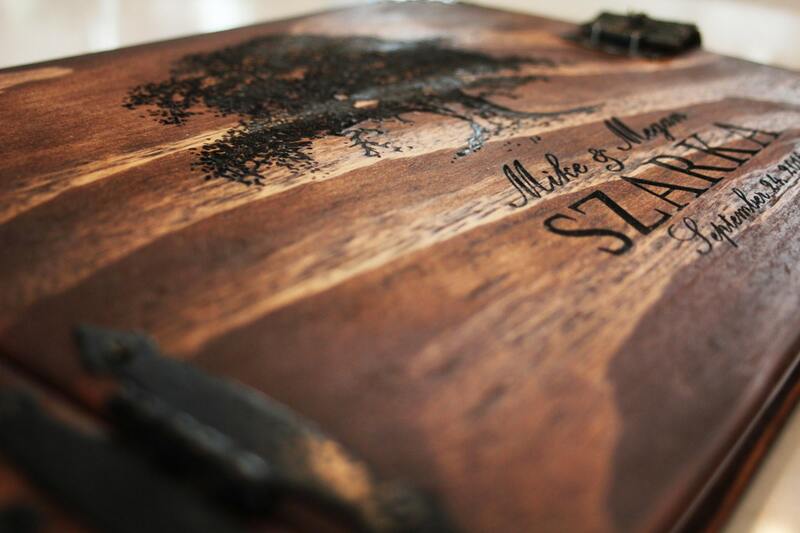 The spine of each book is made with premium genuine cowhide leather and it is rubbed with mink oil to give it a rustic sheen and to bring out a nice leathery smell. Metal hinges or a tied leather braid can be used for the hinge. Please see my other listing for examples of what the braided hinge albums looks like. 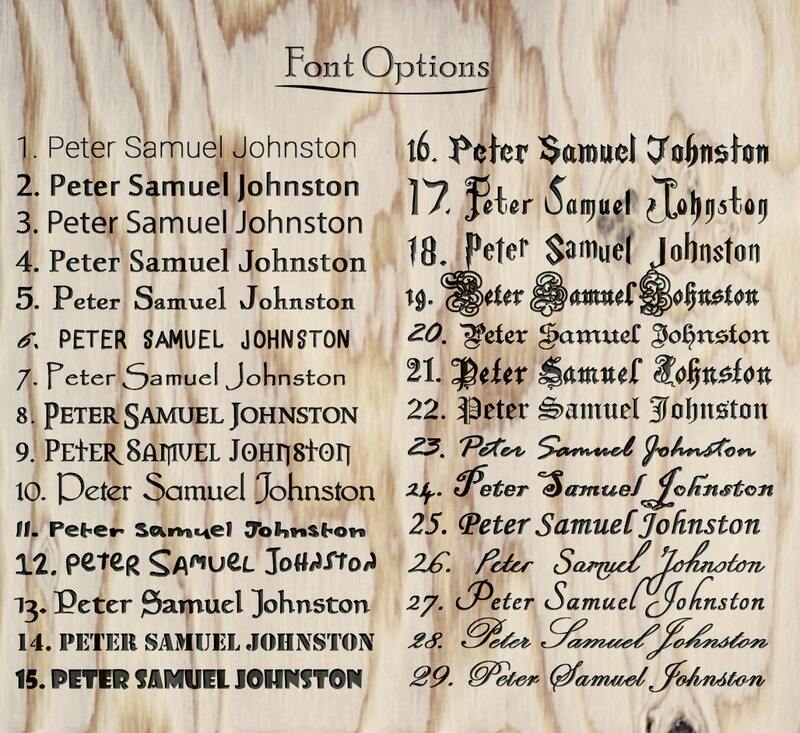 Once your book cover has been made, your name or a personalized message can be engraved into the front cover. Each book comes with your choice of cardstock, cardstock overlaid with clear acid free album sheets, or archival quality acid free 11" X 17" photo pockets. 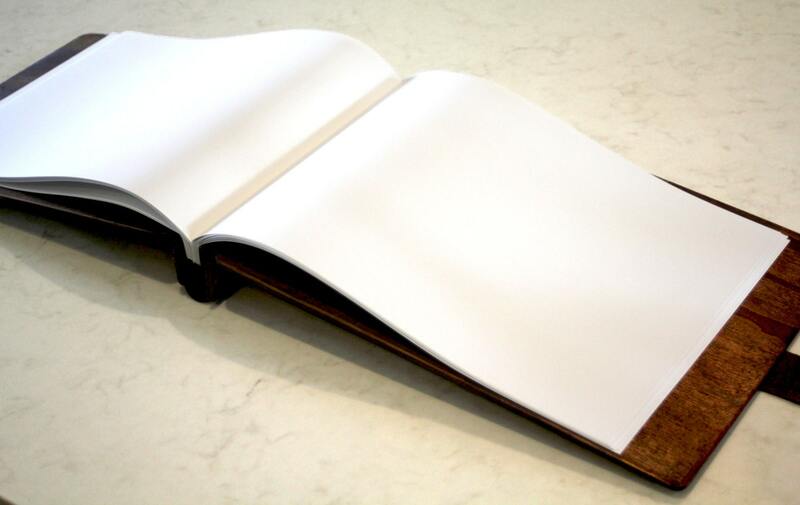 The outer dimensions are approximately 12"H X 19"L. This custom book can be made with a non-hinged back cover or it can be made with a hinged back cover (Pictured above) so it can open flat for better viewing. If you would like a flat opening book select FLAT in size options. 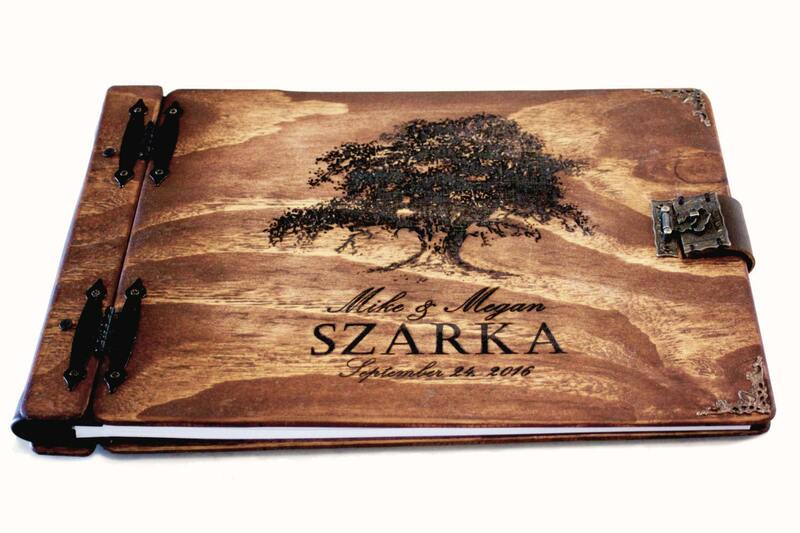 - This is a good option for a guest book, journal, or sketchbook. To select this option choose “cardstock”, or choose “FLAT cardstock” for a flat opening book. These all indicate the same type of page, however, the wording may differ between listings. - This makes it easy to access the cardstock to write on or adjust photos, but still adds a layer of protection when viewing the contents of the book. This is a great option for guest books, poetry books, sketchbooks where smudging may be an issue, photo albums, or any book where easy access to delicate archival material is ideal. To select this option choose “card/clear”, “card/clear album”, or choose “FLAT card/clear” for a flat opening book. These all indicate the same type of page, however, the wording may differ between listings. - These clear pockets are inserted with off white cardstock and they are ideal for photo albums, scrapbooks, and archival of any delicate material. Photo pockets can be used in wedding guest books if you plan to add pictures to/and it or the pages are being filled out then added to the book at a later time, otherwise this option is not recommended for guest books. Removing the cardstock from the protective sleeves and then re-inserting it can make signing your guest book a hassle. To select this option, choose “album/leather”, “album pockets”, or choose “FLAT album pock” for a flat opening book. These all indicate the same type of page, however, the wording may differ between listings.